The studio is none too happy that its upcoming Expendables 3 has been downloaded over a million times online. Those who frequent file sharing sites might have seen a file called "Expendables 3" being offered for download as early as a few weeks ago. Now, film company Lionsgate is taking legal action against the individuals who it claims shared an advance copy of the film online. Last week, Thursday, Lionsgate filed a lawsuit in California against "John Does 1-10," and targets the people behind torrent sites: limetorrents, billionuploads, hulfile, played, swantshare and dotsemper, and "uses language that's similar to past mass 'Doe' complaints against torrent users." According to Lionsgate, it has learned on July 24 that a digital file containing a high-quality reproduction of the action film has been stolen and uploaded on the internet. Lionsgate claims all of the copies circulating online are said to be traceable to the original digital file that got nicked. To date Expendables 3 is said to have already been downloaded over a million times across multiple sites. The lawsuit mentions: "By downloading one of these 'torrent' files associated with the Stolen Film from [limetorrents (dot) com], users join a 'swarm' where they download parts of the Stolen Film from many different users and also upload to other users parts of the Stolen Film they have already received, until eventually they have reproduced the entire Stolen Film on their own hard drives and in most cases have also uploaded all or a substantial part of the Stolen Film to others." Additionally, Lionsgate mentions in the lawsuit that it sent demand letters to the torrent operators mentioned but did not receive a response. 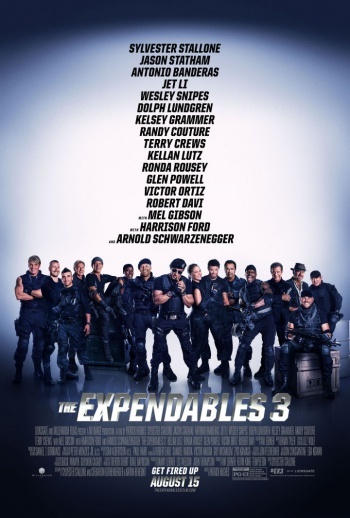 The studio is demanding a temporary restraining order (TRO) and injunctions that prohibit anonymous operators of the sites from hosting, linking to, distributing reproducing, performing, selling or making available copies of Expendables 3. However, Lionsgate isn't stopping there, as the requested injunction also aims to "take all steps necessary to recall and recover all copies of the Stolen Film or any portion thereof that they have distributed," and is even eyeing the ISPs that are providing cloud storage and hosting services, the banks and financial institutions that are servicing said torrent sites. Say what you will about movies not being worth the price of admission, but downloading a film and watching it for free is theft however you look at it -- regardless if you think it's worth paying full admission price or not. Expendables 3 stars Sylvester Stallone, Jet Li, Jason Statham, Terry Crews, Dolph Lundgren, Randy Couture, Arnold Schwarzenegger, Antonio Banderas, Harrison Ford, Mel Gibson, Wesley Snipes, Kellan Lutz, Victor Ortiz and MMA fighter Ronda Rousey for an August 15, 2014 theatrical release.